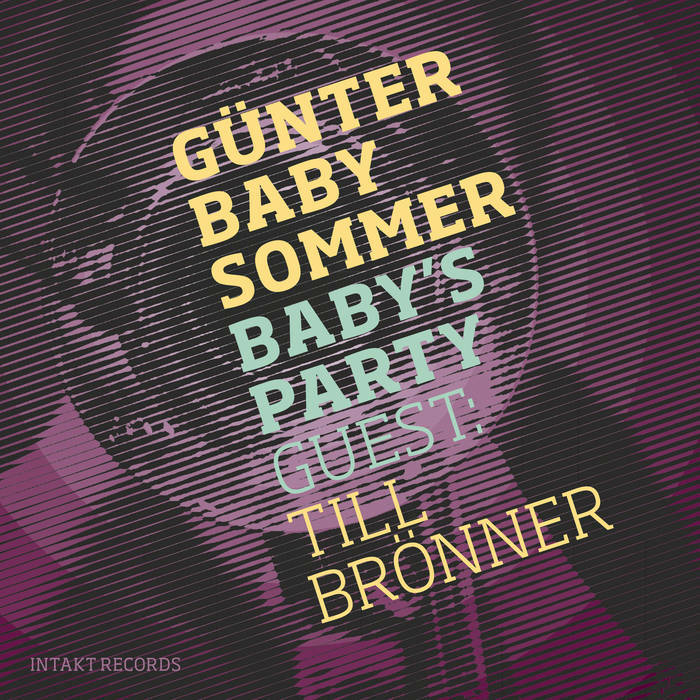 Today we present two contrasting views of the Günter Baby Sommer and Till Brönner's 'Baby’s Party.' Be sure to read Martin Schray's less flattering view here. Günter Baby Sommer was the percussive force of the East German free jazz scene and is today an avant-garde institution in his own right. Trumpeter Till Brönner is of a younger generation and one the luminaries Germany’s post-bop scene. At first, I found this collaboration somewhat curious. However, as Thomas Brückner’s illuminative liner notes point out, the collaboration is already 8 years deep and has been greeted with skepticism since its earliest days. Indeed, Brückner is right that the jazz world has had enough bracketing for a little while. It is time “to overcome what divides, to build bridges, to develop a conjoint language that respects the Otherness of one’s coun­terpart and moulds into a new whole what both sides have to offer.” In this case, both sides indeed have much to offer. From the very beginning, Baby’s Party captivated me. The first track, “Apero con Brio” begins with the clump of a bass drum and cymbal, followed by a crisp, brief trumpet phrase. The two continue in disjointed dialog until Sommer settles into a slit drum groove over which Brönner waxes his brass poetry. This act sets the tone for the rest of the album. The result is playful, yet intimate. Its sensibilities range from pop (or, at least, standards) to Sommer’s ever-inquisitive, ever-resourceful explorations of timbre, resonance, and rhythm. “First Shot” follows with an arrhythmic rattle of glassware generated in part through the scrape and ding of actual utensils over which Brönner layers a lonesome, echoing trumpet. Next comes a mournful, then briefly exuberant “Special Guest No. 1: Danny Boy” wherein the musicians seize the space and initiative to deconstruct and reinterpret sections of the Irish elegy. “Flinke Besen” is a race paced by Sommer’s rapid brush roles that seem to delight more in the sound produced by distinct combinations of strokes than the percussive onslaught that drumkits often tempt. “Second Shot” features Sommer on the mouth harp over which Brönner tenderly improvises. (I think I hear the trumpet reverberating off a dormant snare in the background, which lends an ethereal feel to the track.) “A Soft Drink in Between” begins with an ominous layering of gong, bells, and split drum. Brönner enters with a muted, wistful horn augmented by an echo effect. This poses a stark contrast to “Inside-Outside-Trip,” which opens with Sommer’s enigmatic vocal incantations and develops into a funky bop number. The influence of Miles Davis on Brönner is unmistakable. Sommer and Brönner share melodic duties on the infectious “Third Shot.” “A Little Nap in Between” begins with a whispered brass and percussive drone that develops into a slow and dreamy duet and fades again into a fading murmur. “Special Guest No. 2: Der Alte Spanier” incorporates Spanish-tinged brass, welling drum-lines, and a return to Sommer’s ludic vocalizations. As a celebration of old age and life (presumably), it serves as a fitting complement to the solemnity of youthful loss inherent in Danny Boy. The final track, “Party Over – In a Sentimental Mood,” begins with a crackling that evokes the pitter-patter of rain. When Brönner enters with the first notes of the melody, it is already clear that what follows will be a sparse, tempered, and contemplative affair. Or, rather, an end to the affair. This album is excellent. The two musicians play well with the space and individualization that that such a format allows. They approach each piece (all except “Danny Boy” and “In a Sentimental Mood” written by Sommer) not just as a distinct composition, but also as a movement within a greater opus, or a scene in a story. Each track has its merits and makes a unique contribution. Nevertheless, the power of this release resides in the narrative coherence that underlies the stylistic diversity. It also resides in the openness, responsiveness, and eagerness with which these two distinct and distinguished musical minds - thoroughly accomplished in their own corners of the jazz world – came to this exercise in bridge-building. Such projects rarely work out this well.